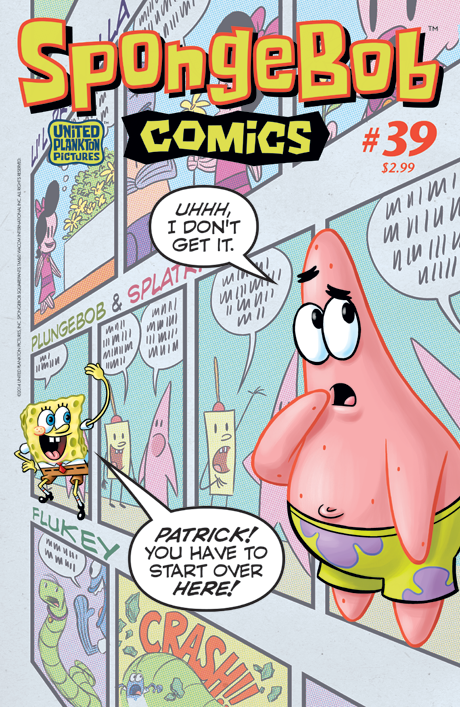 A sneaky cartoonist (i.e., a normal cartoonist) turns SpongeBob and Patrick into the stars of a new hit comic strip–"PlungeBob and Splatrick"– and the briny buddies can't handle the fame! Then, in "Ship Wrecked," Mrs. Puff's vacation cruise is severely compromised by a certain stowaway fry cook. Plus: Kaz (Underworld) and Gary Leib (Idiotland) tell the tale of the customer who hates SpongeBob; Maris Wicks (Primates) reveals scientific secrets of the puffer fish; and Scott Roberts (Patty Cake) draws a very Pogo-esque SpongeBob pin-up!